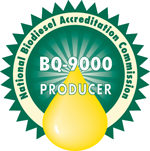 Community Fuels was the first company in the nation to earn BQ 9000 Laboratory, Marketer and Producer certifications. Our fuel is primarily used as a premium additive to diesel fuel. When blended with petroleum diesel, our fuel increases lubricity, which improves fuel performance and reduces the wear and tear on engines. Our fuel also results in lower emissions, serving as an important tool to assist petroleum companies in meeting multiple regulatory requirements such as the EPA’s Renewable Fuels Standard that requires one billion gallons or more of biomass-based diesel be blended into the nation’s fuel supply each year. Our biodiesel meets the EPA’s Advanced Biofuel Standard and we have defined our own fuel requirements as well that exceeds the Federal fuel standard (ASTM Standard) and closely mirrors the standards of major oil companies. We can custom process advanced biofuels from multiple sources of raw materials (fats and oils serving as feedstock) to meet evolving and increasingly stringent fuel requirements. At our Port of Stockton bio-refinery, we have an advanced laboratory that enables us to perform fuel testing internally, which ensures that all the biodiesel we manufacture and sell surpasses our and our customers’ quality standards. By manufacturing a superior quality product, we are able to serve a segment of the market that recognizes and values consistently performing premium fuels. Contact us at sales@communityfuels.com or 760-942-9306 x102 for more information about our products and services. 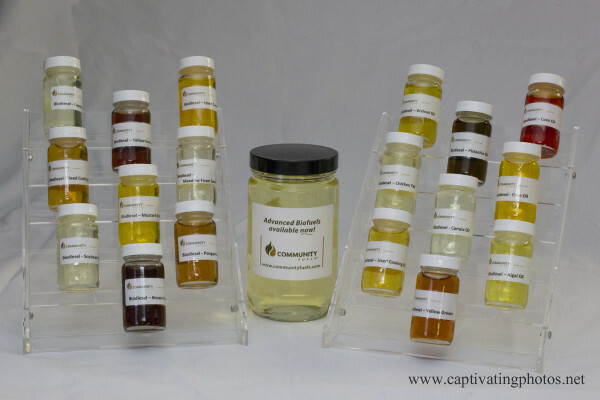 Samples of biodiesel produced by Community Fuels from various feedstocks.